The time has come to throw down the gauntlet to all comers. I don’t care where you are from, what part of the world you live in. I have one statement of fact that you’ll just have to accept. There is no finer beigel than a Brick Lane beigel. I remember the first time I went to New York. I was all a quiver with anticipation at the food I was going to lay my hands on. High on the list were the beigels that I’d seen in an episode of Happy Days as a child. Mr Cunningham comes back from a business trip in New York only to find Al Delvecchio waiting for him at home intent on eating beigels that Mr Cunnigham has promised him, but leaves in tears after Mr C has eaten them all on the plane. Now, I’m not saying I didn’t have my fill of gob smacking food on that trip (and on many subsequent trips) but I left disappointed. Every beigel I ate was held up as an example of what a beigel should be, however, I learnt an important lesson. That those fine folk at the 24 hour Shop in Brick Lane, E1, London are the undisputed masters of the beigel craft and what’s more, they have been knocking out these marvels for over 30 years. Now, I expect your howling with derision. Howling, not only at my probably ludicrous claim, but also at my insistence on spelling it “beigel”. I’ll try and explain. I have to admit a deep abiding love for the area around Brick Lane, I love its onion like quality. It’s a part of London where you really can peel back the layers and see the marrow of the place. On the surface a sprawl of Bengali restaurants, the latest people to make the area home, look a little closer and the area’s Jewish roots become apparent, look closer still and there are echoes of Spanish and Portuguese settlement. The shell of the Old Truman Brewery, which squats ominously in the middle of the street, dominates the whole area, the beer is long gone but the building is filled to the rafters with artists, designers and djs. Look up the street and you’ll see the cutting edge of gentrification and redevelopment bearing down on you with slick coffee shops and clothing stores mushrooming up. Pretty soon I imagine the area will change yet again, but I imagine the echoes of its past will always be there even if those are the echoes of a certain gentleman with a penchant for stove pipe hats, ladies of the night and butchery. Ummm. A warm bagel just-out-of-the-oven, in Brick lane, 3am in the morning, on the way home in a taxi from a little drinking session in town. I haven't been to NY - but those bagels from Brick Lane are the best I have ever tasted. They don't need to be toasted - they are already crisped on the outside. I just like 'em unfilled when they are that fresh. Maybe a sesame one, or poppy seeds. Ummm. I just ate dinner, and you made my tummy rumble. I'm sometimes a little slow on the uptake so please excuse my naive question: what's in that bagel? Also, do you remember where in NYC you had the disappointing bagels? I wonder also if you ever made it to Montreal? They make incredible bagels there too, quite different from the New York style. I live in a town (Milwaukee, perhaps you remember it from Happy Days) that boasts no edible bagels whatsoever, so I would be quite pleased to eat the ones you describe even if they're not the best in the world. The idea that the best bagel comes from England seems preposterous but lacking the evidence I can't very well call you crazy, can I? Nice blog you've got here (I came via AH if you're wondering). Sam: You know they are best when a couple of sheets to the wind and with too much mustard. Cookie: That's how they spell it in the east end! MZN: Preposterous I know, but true! That's some of the best salt beef you can get in this town. "best beigel"? Being a New Yorker, I could probably pull out a few things to object to your statement, but I also have never tried the Brick Lane version so I'll restrain myself. MZN is on the right track with the Montreal bagels...very different texture. I pronounce it 'baygul' However, the best and oldest beigel shops in London all spell it 'beigel', which is the Yiddish / German spelling, and correctly pronounced 'bygul'. The interesting thing is that the Cockney pronunciation is also 'bygul', so whether that's accent or historic, I'm not sure. 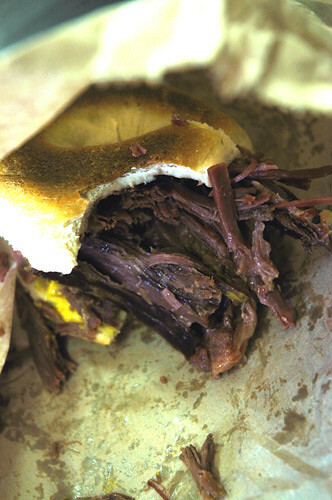 OK I get the beigel/bagel thing.Never heard of salt beef.Looks like yummy pot roast.You got a recipe?Puleese! If the rumour mill is true you might be working just round the corner from one of them soon? 's great beigels, those brick lane ones. i've seen many beigels (e.g. sold at portobello market) advertised as 'brick lane beigels' - but ya gotta get them fresh (& possibly with a side of the luscious cheesecake as well) for maximum satisfaction. Rose: You could probably throw a million objections my way and I'd probably have to agree. But deep down the combination of nostalgia, history and love will win out! Denzylle: Thanks for that. I've alway gone with baygul, and I was born within the sound of Bow Bells. Anon: You know it! if you get some straight out the oven...oh crickey! Hi Monkey Gland - I've had a Brick Lane beigel!!! It was a very late winter night and we got slightly lost on the way looking for _the_ place (despite being taken there by a Jewish Londoner). But I can still vividly remember the saltiness of the meat. Too much food for me at that ungodly hour, but it was delicious! I am an American Jew living in London. I agree that the Brick Lane Beigel is of a superior breed. Many of the NY (where I lived for 8 years) bagel places are no longer making bagels correctly - that is, boiling and then baking to produce the tough, chewy consistency that a proper bagel or beigel should have. But there are still a few old school places, such as H&H, where you can only buy bagels plain, unsliced. The best place in the US to buy bagels is actually in Skokie, Illinois, at the incongruously named New York Bagel and Bialy Company.